Experience Shangri-la Golf & Country Club in Hambantota Sri Lanka when you travel with Golf Tours Abroad. We also recommend staying at the luxury 5-Star Shangri-la Resort & Spa. 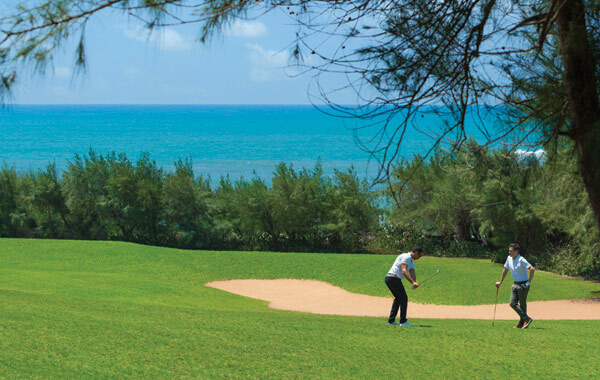 The Coconut Plantation – offering lush fairways and challenging bunkers. The Dunes Area – with its subtle elevation changes gives you breathtaking views of the Indian Ocean. Because of the resort’s dedication to biodiversity and habitat conservation, the course development was approached from an eco-perspective by revitalising an abandoned sapphire mine. The end result was a glorious restoration of native vegetation, resurrection of local birdlife and an intelligent use of salt-tolerant turf & shrubs. The Clubhouse overlooks the 18th green which is a welcome haven for golfers at the end of their game. Located within the clubhouse is Ulpatha restaurant, which offers beer on tap, refreshing drinks from the island bar and delicious, pub-style light meals in a warm and inviting atmosphere. Refreshments are also available on the course, with all electric golf carts equipped with cooler boxes. The Pro Shop is a haven for golf enthusiasts, with an array of golf essentials available for purchase, including caps, polos, shoes and sunglasses – as well as the latest equipment for hire. Shangri-la Golf & Country Club features in our Sri Lanka Scenic golf holiday package. For further information on staying at the Shangri-la resort, visit our Shangri-la Resort & Spa Hambantota blog page for the inside running on the beautiful seaside resort.